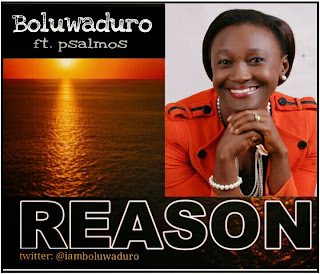 Gospel Music minister Boluwaduro is out with a brand new single, a powerful rock piece titled "REASON" featuring one of naija's finest vocalist & music minister Psalmos. "Reason, is one of such divine gifts from God released by the Holy spirit to me during my quiet time. It's a song that renews our stand and decision to choose Jesus Christ over and over again, a song to remind us of our purpose here on earth. The Bible says in Galatians 2 vs 20 "For I am crucified with Christ, nevertheless I live, yet not I , but Christ that liveth in me ". That's the message in Reason. Boluwaduro is a gospel music minister, a part of her the world is earnestly waiting for. it is a divine call she heeded many years ago to become a true worshiper in spirit and truth, since then has remained so by God's mercies. God has always shown forth His greatness and wonders through her soul lifting and divinely inspired gospel songs, lyrics and live performances in deep worship and prophetic praise, one of which includes an annual evening of worship program tagged 'A Date With The King' ,which comes up every 1st of Oct amongst other life changing worship programs. Her first album was released in 2008 titled 'Jiji Moji', a collection of yoruba contemporary songs. she also featured in some other music works like 'Gbemisoke' the OGD all stars,'Balo' by Psalmos and many more.